The product of one of Germany’s ‘bigger automakers’ back in the fifties, the Lloyd is a classic mini car that packs a full-sized punch when it comes to innovation, quality, and design. 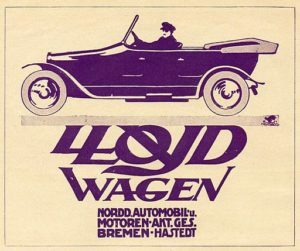 The images shown are of a 1955 Lloyd, but the Norddentsche Automobilund Moteren A-G company began producing the Lloyd motor wagen in 1906. Later, after company mergers, Lloyd Moteren Werke GMBA began sending the first post-war Lloyd wagens off the line. While early-model Lloyds were available with a two-stroke engine, post-war Lloyd wagens featured the option of a 600 cc engine as well as a synchromesh transmission featuring a tight ‘H-pattern’ column-mounted gearshift. 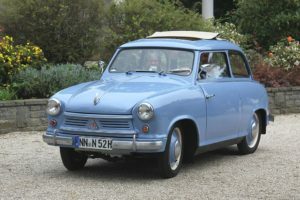 The lean physical size of the four-stroke parallel twin engine, which was cooled by radial fan, put out 24 horsepower and takes up less than a fourth of the Lloyd wagen’s length, leaving legroom for the car’s occupants. 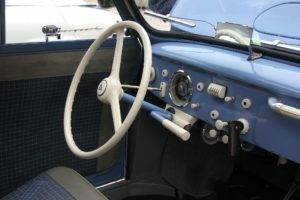 The dash of this vintage mini-car features clean, simple lines, with a single behind-the-steering-wheel gauge and only a handful of dashboard dials and knobs. The upholstery follows through on the classic, minimalist style with two simply-styled bucket seats in front and a bench seat in the back – though in ’59, the Lloyd-Hartnett 600 TS model featured pleated door pockets for an added touch of utility and style. One early driver of the Lloyd compared its handling to riding a motorcycle, saying it was able to thread in and out of traffic with ease. If you are looking to buy or sell a classic car, such as a Lloyd wagen or any other, feel free to take advantage of the free listings on the Classifieds page.